If we hadn’t seen a video of the T30 Hotel going up in China, we might not have believed that anyone, anywhere could erect a prefabricated 30 storey tower in just over 2 weeks. But it’s true – Broad Sustainable Building, a subsidiary of the BroadGroup construction company, has broken their previous record of constructing a 15 storey building in one week with their latest project in Hunan Province. 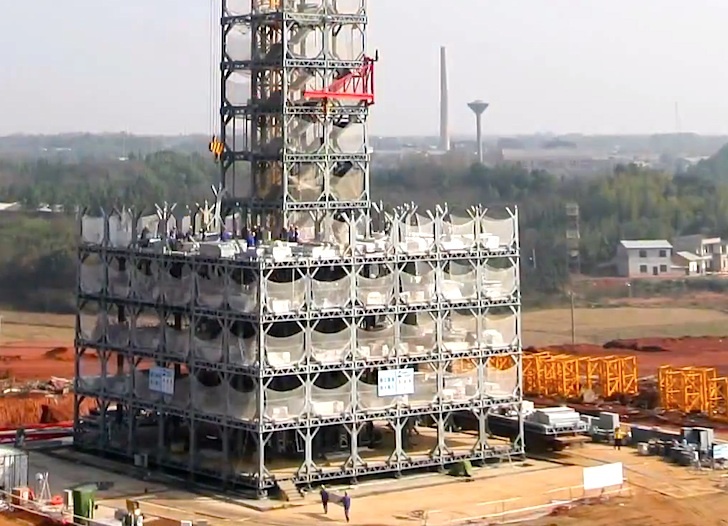 Not only did BSB get the T30 Hotel up in 15 days or 360 hours (with the help of 200 super speedy construction workers), but the company claims that their 17,000 square meter tower is 5 times more energy efficient than the competition and generates a fraction of the waste. It is also said to have the capacity to withstand an earthquake that measures up to 9 on the Richter Magnitude Scale! Take a look at the incredible time-lapse video of the hotel’s construction after the jump. We typically advocate prefabricated building construction because it greatly reduces energy and material waste, and BSB claims that the China Academy of Building Research certified their new T30 Hotel to be perfectly safe, but we have to wonder what China will look like in 20 years if contractors throw up a new 17,000 square foot tower every 2 weeks. While an impressive engineering feat that boasts enormous eco-credentials such as external solar shading, superb energy efficiency, a heat recovery system, and a state of the art air purification system makes the air quality inside the hotel 20 times better than it is outside, we aren’t 100% convinced that this kind of scaled prefabricated construction is the most appropriate answer to the challenges posed by climate change, pollution, or population growth. BroadGroup’s Zhang Zue disagrees. He told WAN that China needs to “speed up [their] environmental thinking.” He added that “We need buildings like this all over China.” We’d love to hear from our readers. Do you think that the T30 Hotel is setting a good precedent in China? How many days does it need to collapse down? It seems that your article's argument against this is aesthetics: "we have to wonder what China will look like in 20 years if contractors throw up a new 17,000 square foot tower every 2 weeks." It's a faulty argument, in any case. Just because contractors can do this doesn't mean that it will be done every two weeks. The rate obviously depends on demand. Having said that, tall towers are definitely more sustainable in terms of housing more people on less land. By itself, tall towers work. But tall towers do not justify increasing populations nor, but itself, does tall towers lead to greater population growth. Great article! It makes me wonder how long the actual planning and prefabrication took to develop. If we hadn't seen a video of the T30 Hotel going up in China, we might not have believed that anyone, anywhere could erect a prefabricated 30 storey tower in just over 2 weeks. But it's true - Broad Sustainable Building, a subsidiary of the BroadGroup construction company, has broken their previous record of constructing a 15 storey building in one week with their latest project in Hunan Province. Not only did BSB get the T30 Hotel up in 15 days or 360 hours (with the help of 200 super speedy construction workers), but the company claims that their 17,000 square meter tower is 5 times more energy efficient than the competition and generates a fraction of the waste. It is also said to have the capacity to withstand an earthquake that measures up to 9 on the Richter Magnitude Scale! Take a look at the incredible time-lapse video of the hotel's construction after the jump.